Indy is unlike any other race in the world. It is run at the end of May on Memorial Day weekend, but intensive practice begins at the start of the month. For decades, teams would spend every day for four weeks (although since 2005 they’ve reduced it to a couple of weeks) testing, tuning, practicing, qualifying, and preparing—more than at any other race event. It is the single biggest sporting event in the world and arguably the most famous and prestigious auto race internationally. There is a reason why racing teams talk about those weeks at Indy as “the year of May.” They are long, grueling, and filled with incredible pressure and stress. Legends are made during the month of May. Drivers have died during the month of May. And others are just disappointed beyond words. My love affair with the Indy 500 began at the age of nine. That’s when I started my Indy education. I learned about its history by reading magazines and talking with drivers my dad knew who had either raced there or dreamt of doing so. Every year I watched ABC’s Wide World of Sports clips of the qualifying events, then ultimately the entire race on TV. By the age of twelve, I could tell anyone who would listen the names of every winner since Ray Harroun won in 1911, and often the type of car they drove. By my early teens, not a night went by that I’d go to sleep without thinking and dreaming of racing at Indy. This was not a passing thought. It was a need—a need stronger than any drug addict has possibly ever felt. I have never done any sort of drugs in my life, but I can relate to what an addict goes through. Indy was my drug. In 1993, I was going to feed the need. 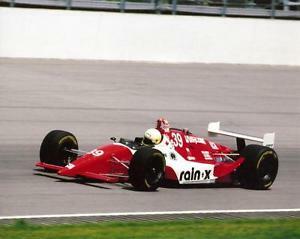 I was part of a three-car team, and Robbie Buhl and Eric Bachelart were my teammates at Dale Coyne Racing. We all had high hopes. During our first five days of practice, we each had an engine blow up on us. A blown engine was not uncommon, but having three go in that short time was unusual. And the worst thing was that when Robbie’s engine blew, his car spun and hit a wall. When cars hit the wall at Indy, it’s a big deal. Robbie was doing over 220 mph when he crashed. After being checked over at the track’s infield medical center, he was sent to Methodist Hospital for a night under observation. He suffered a concussion, and doctors told him he would not be able to drive for a week. That was Thursday, May 13. On Friday the 14th, Eric and I were practicing, along with thirty-plus other drivers all preparing for the start of qualifying the next day. The track was shut down temporarily to allow officials to inspect it (this is done if there is any possibility of debris on the track surface), so the two of us were sitting in our cars in the pit lane, nose to tail, awaiting the start of practice again. Once the green flag was thrown, I pulled out of the pit lane with Eric right behind me. As I was leaving, I noticed that none of the other cars were moving out right away—this was an important thing to notice, as I’d find out less than two laps later. Their crews were making final changes and last-minute adjustments to their cars. The two of us completed the first lap and got up to speed, with Eric still right behind me. Both of us were going over 225 mph down the straightaways and just under 220 in the four turns of the Indianapolis Motor Speedway. But when I entered the short straight section between Turns 3 and 4, everything went wrong. We learned later that my car’s fuel regulator, which sat above the engine but was located directly up from and behind the cockpit, had cracked, spraying methanol fuel on top of me and into the cockpit. That burning fuel literally engulfed me. Read the painful continuation of the story next week right here.